Both in the Global South and North, bioeconomy strategies have become the target of critical interventions by environmental groups and social movements. In the discussions and analyses of German development policy groups, however, the term bioeconomy has surfaced only very recently. 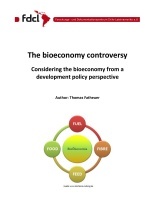 A critical debate and careful analysis of the recent wave of bioeconomy strategies that have developed against the backdrop of the climate crisis and, within this context, the increasing popularity of the notion of a ‘green economy’, is still in its very early stages. While the bioconomy is clearly an important yet problematic strategy that is being promoted by actors in the fields of business and politics, our options to counter this offensive remain unclear. to stimulate a more profound debate concerning the bioeconomy as a field of action.